What to see in May in the New Forest National Park? There are mainly 2 reasons to come to the New Forest in May: to see Foals and Flowers. New Forest foals arrive through the second half of May, and it is exciting. First you see one newborn foal wobbling next to its mother. Then a second. Then a handful. Then a whole moor with gambling, sleeping and staggering foals. It is one of the miracles of the forest and a great reason to walk, cycle or drive through the 94,000 acres of wonderful New Forest. New foals are for watching, not for touching. And, they are fabulous to watch. Playing with their fellow foals, getting spooked by a butterfly, catching a breeze and just kicking up their heels, then dropping exhausted for a long carefree sleep watched over by their patient mums. Proud mums will often bring their new foals into the village to show them around. It really is a beautiful and hopeful sight. When you aren’t foal watching in the May forest then there is time for Exbury Gardens. Establishing by Lord Rothschild the gardens have a world-class collection of rhododendrons, camelias and azaleas. Before planting Lord Rothschild spent five years preparing the ground, creating an intricate watering and drainage system and hunting out the finest specimens from around the world. Don’t miss the fountains of colour. 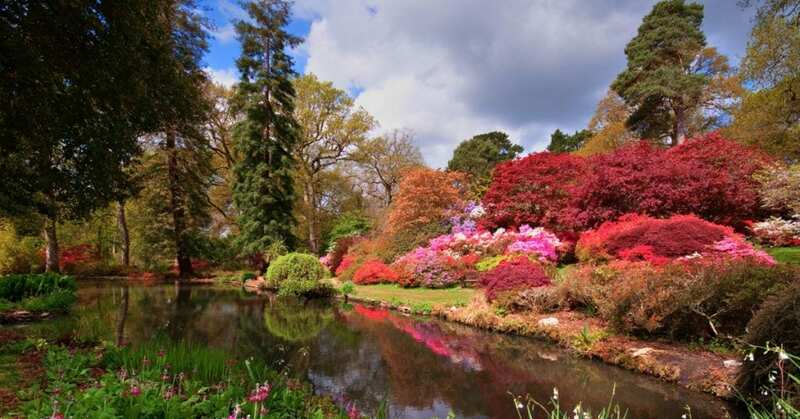 Exbury Gardens are a short drive from our hotel, less than £10 per head to go into the gardens they are a wonder not to be missed.